This plant can be elusive, as it is hard to see when the conditions are not perfect. Perfect conditions are: a cloudless, windless day with the sun shining directly in the place you are looking, with few floating fragments in the water (not after it rains and no algae blooms). Without these conditions, it is difficult to see more than a foot deeper than the surface of the water. Also, the brighter the sun, the brighter green this plant will appear. Below is a photo of fanwort from the UMass biology department. Fanwort is a native of the southeastern U.S., but is considered to be a non-native invasive plant in the northeast and nortwest of the United States. The fanwort found in Hickory Hills Lake is called cabomba caroliniana. Fanwort is a rooted submersed plant that may have submersed and floating leaves of different shapes. 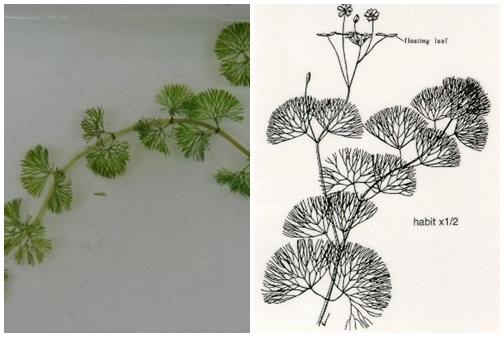 It generally grows in three to ten feet of water and is found in ponds, lakes and quiet streams. Click here for a short video on identifying fanwort.